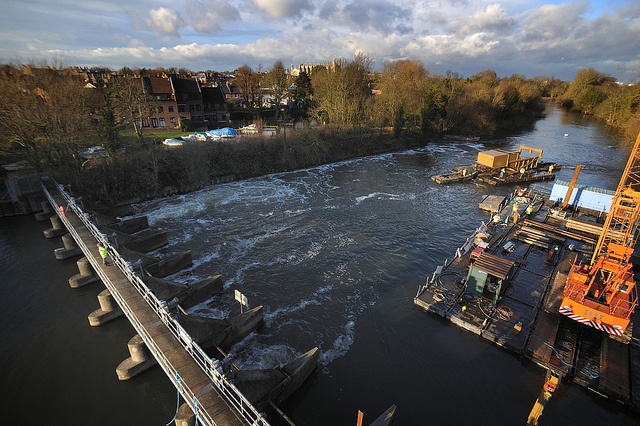 Romney weir is turning the screw on CO2. 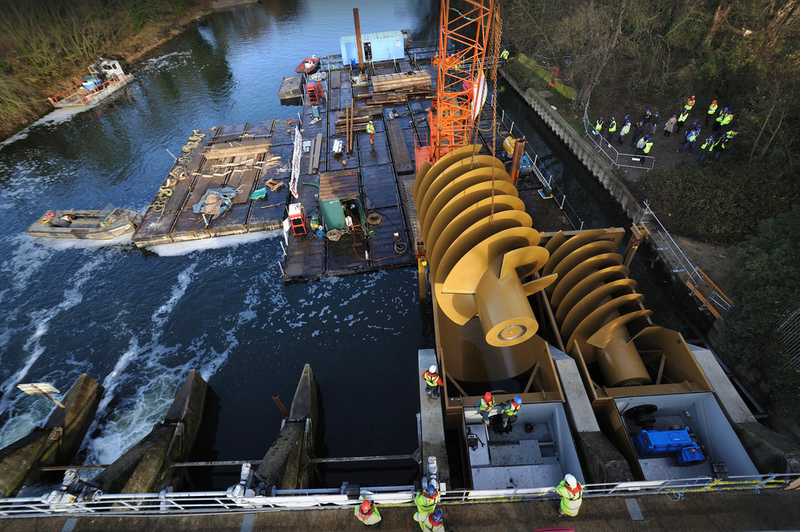 Two Archimedean Screw hydro turbines, rated at 150kW each and designed by Mann Power Consulting Ltd., are to be installed on the weir to generate clean, green electricity that will be used locally. With a total capacity of 300kW this will be one of the largest Archimedean Screw hydro schemes installed to date in the UK and Ireland. 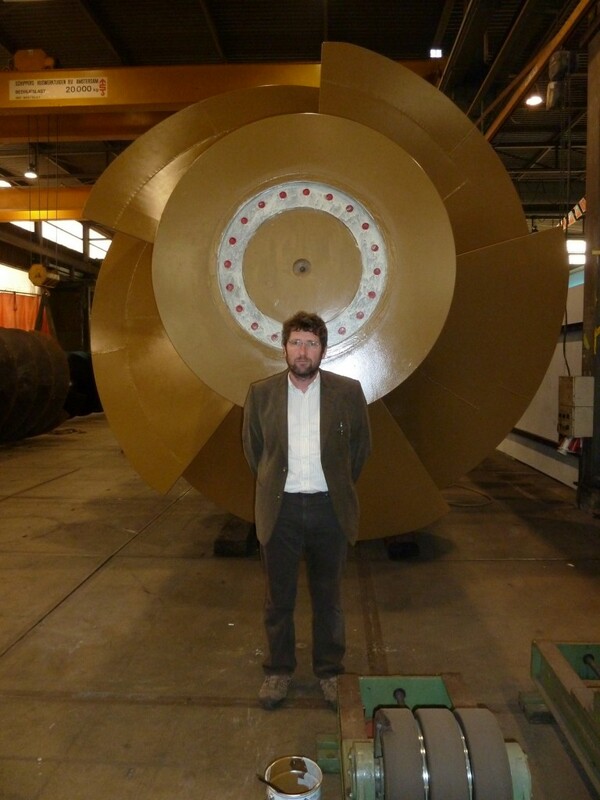 The largest single screw was recently installed at Shane’s Castle in Northern Ireland, rated at 214kW it is the largest ever manufactured Archimedean Screw hydro generator and was designed and supplied by Mann Power . Romney Weir ‘A’ is in Windsor. 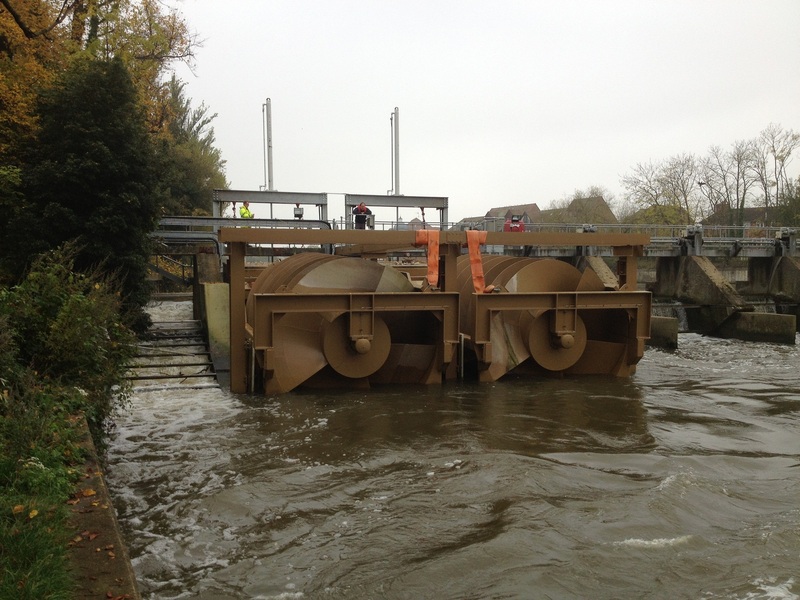 The weir was built in the 1790’s and is used to control water levels between Old Windsor lock and Boveney lock. The Romney Weir hydro scheme will utilise just two of the ten existing weir bays and have little effect on current weir operations. 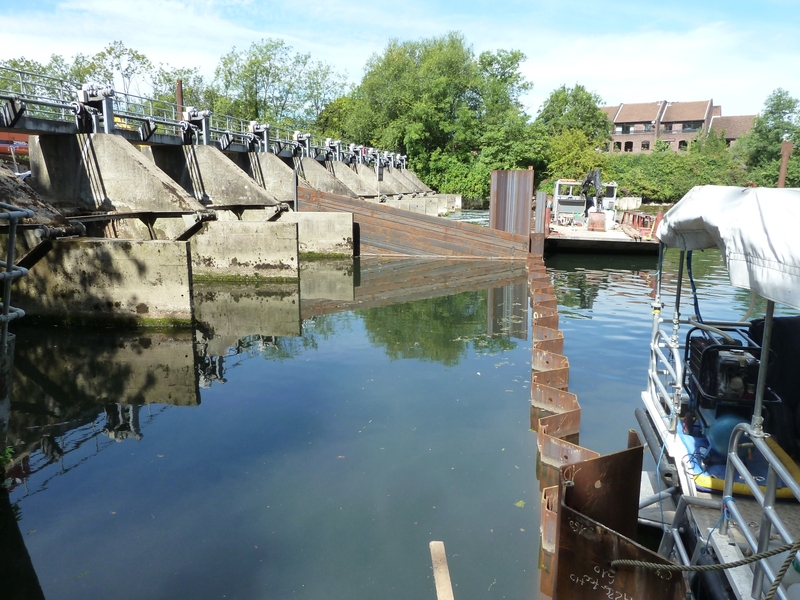 Weirs were originally built to control water levels for navigation and flood risk purposes but can now take advantage of new technology to provide energy. To help ensure the £1.7million project both generates clean energy and improves the local environment the old Denil type fish pass will be replaced with a Larinier style fish pass which will enable over 12 species of fish including trout and perch, as well as endangered eels, to migrate up this stretch of river, some for the first time in over 200 years. The scheme will be fitted with a number of environmental protection measures including rubber bumpers on the turbine blades to minimise risk to fish. 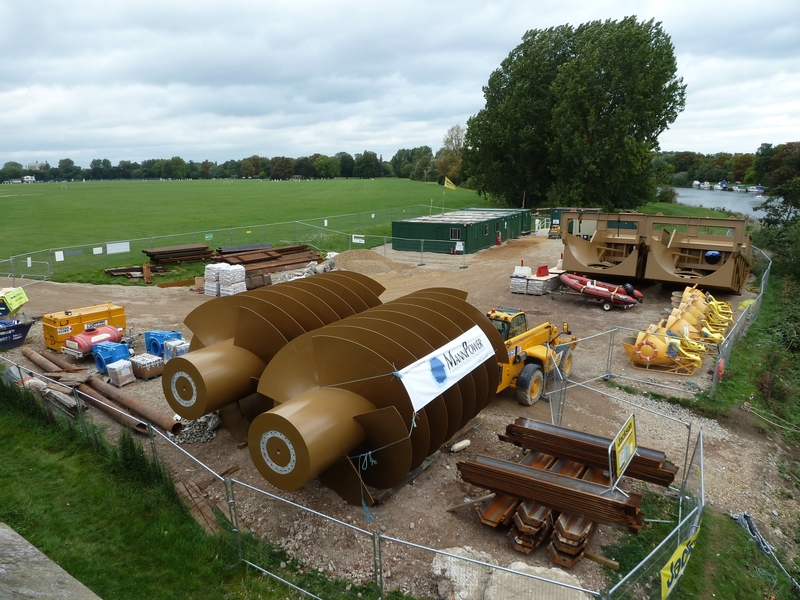 The project, which was granted planning permission in August 2008, will consist of two four meter diameter Archimedes screw type turbines occupying two bays in the Romney Weir and will generate 300 kilowatts per hour at peak times, enough to power 600 households. It is estimated the turbines will reduce carbon dioxide emissions by 790,000 kilos per year. This clean, green electricity will be used to power Windsor Castle. 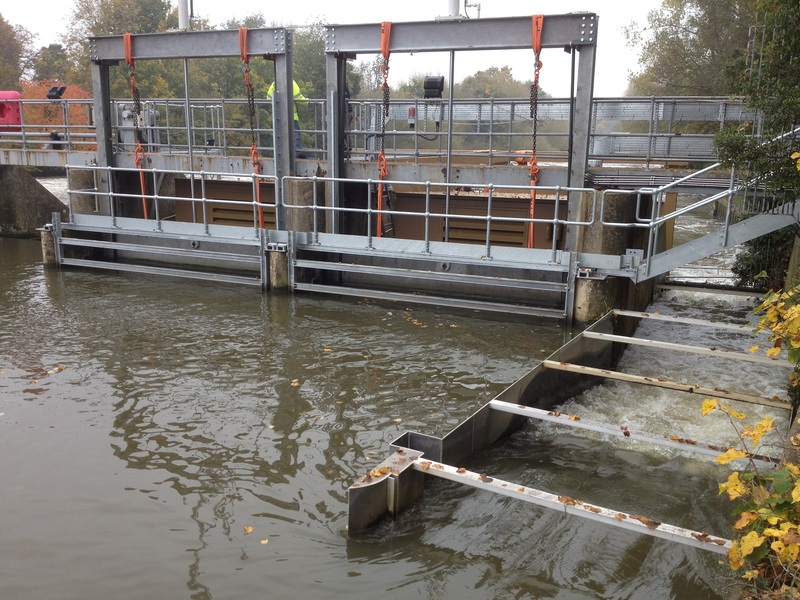 Mann Power Consulting Ltd., the UK based Archimedean Screw specialists designed the equipment for the Romney Weir project. After various consultations it was decided that the most suitable turbine for the site was an Archimedean Screw Hydro Turbine which was manufactured by Landustrie based in Holland. The Landy screws are four meters in diameter, 6 meters long and each has the capacity of 150 kW. A unique feature of each screw is the number of blades or helices; here being 5 instead of usually 2 or 3. 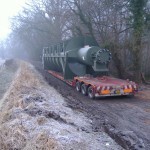 This is the first five bladed Archimedes Screw Hydro Turbine to be installed in the world to date. 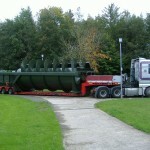 The two 150kW Archimedean Screw turbines arrived on site in the early hours of Wednesday morning 7th September 2011. 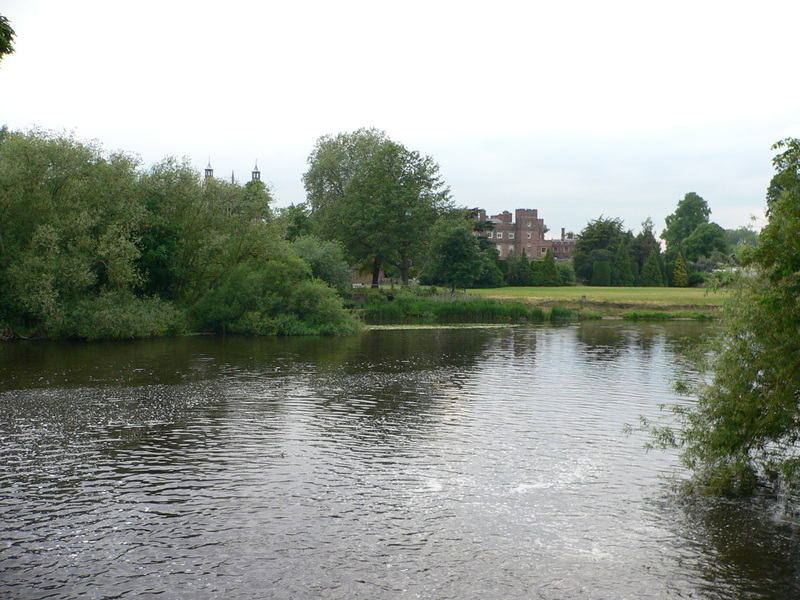 The golden brown colour of the turbines and their housings were chosen by the residents of Eton, who look out onto the weir. 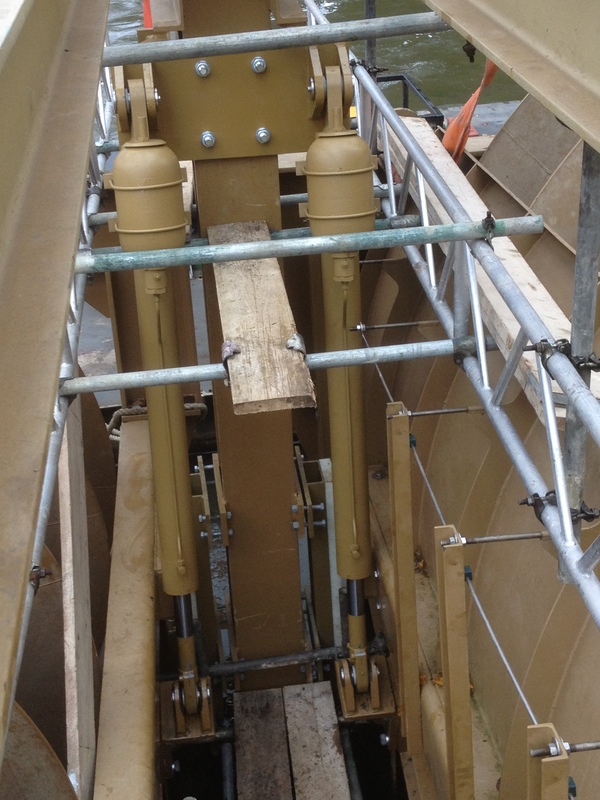 Four Hydraulic Rams have been installed to automatically move and adjust the two 94 tonne turbines as the river level changes. Commissioning of the scheme is expected to take place in the coming weeks. The fish-friendly Archimedean Screw hydro turbine. The Archimedean Screw turbine provides a fish-friendly alternative to conventional turbines, ideally suited to low-head (1m-10m) sites, and sites with fish protection issues. Extensive fish passage tests have conclusively demonstrated that the large water chambers and slow rotation of the Archimedean Screw allow fish of all sizes, and debris, safe passage through the turbine. 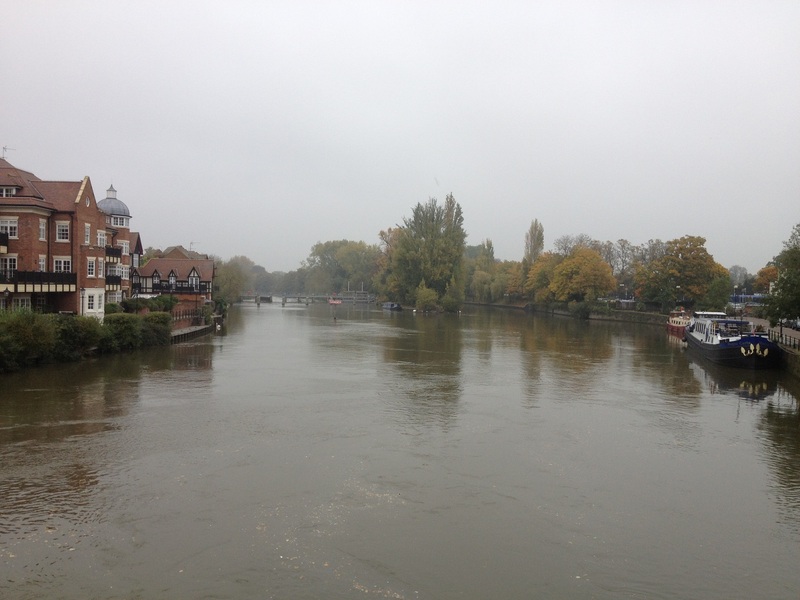 As a result, the Environment Agency has agreed that no screening is required. 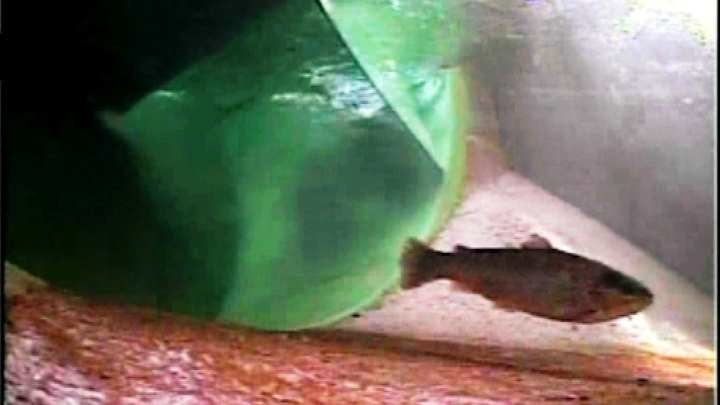 Literally thousands of fish passages have been monitored and recorded using underwater cameras at the intake, inside the chamber of the Screw itself and at the outflow to assess the effect of the Screw on salmonids (including smolts and kelts), brown trout and eels. The trials looked at fish passage across a broad spectrum of sizes and turbine speeds, possibly the most impressive of which was the safe passage of a kelt measuring 98cm in length and weighing 7.6kg. In addition, behavioural and migrational patterns across the species have been shown to be entirely unaffected by the turbine. 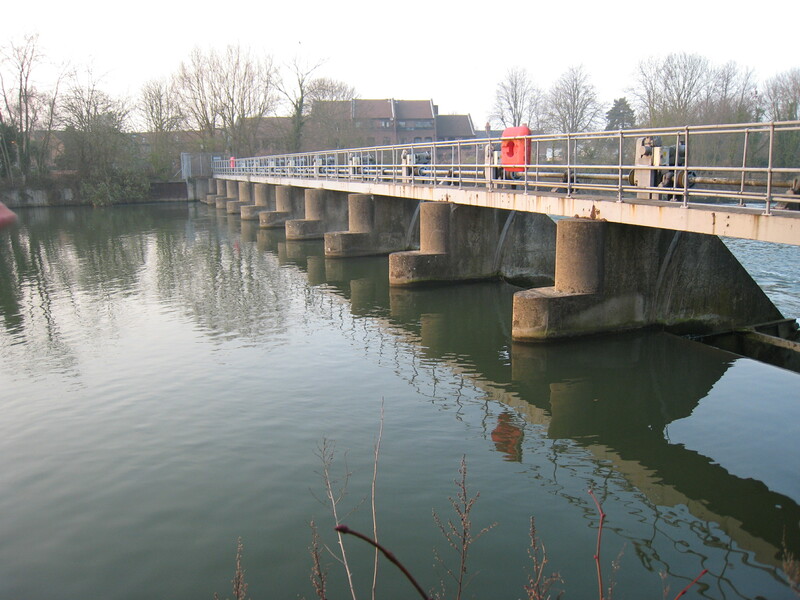 Dave Mann commissioned the fish passage studies instrumental in persuading the Environment Agency to accept the technology. 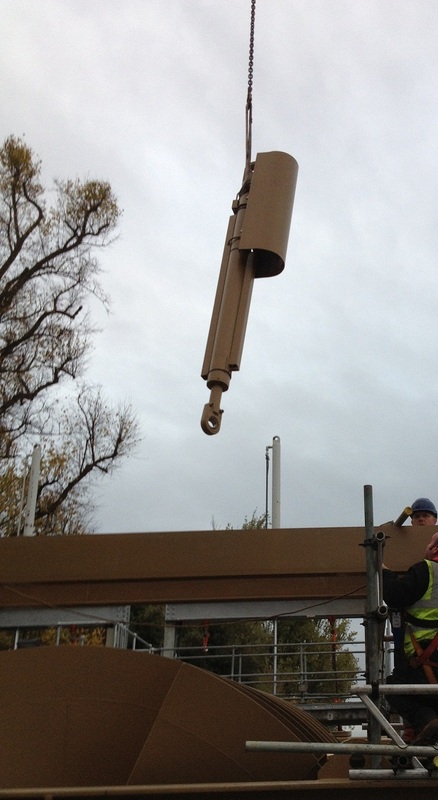 Mann Power have a proven track record of successful installation throughout the UK and Ireland. 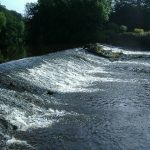 One of the first challenges presented to Mann Power when Dave Mann set up the consultancy firm in 2003 was to find a hydropower solution for a community project in North Yorkshire, situated in a low head site within a Site of Special Scientific Interest with particular stipulations for the protection of an endangered fish species. 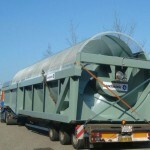 The result of extensive research into possible solutions culminated in the introduction of the Archimedean Screw turbine – already widely used in continental Europe – for the first time into the UK, and Mann Power have been at the forefront of supplying this equipment for hydro generation projects since 2004. 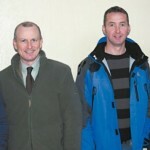 Mann Power now supplies this equipment throughout the UK and Ireland, as well as providing expert consultancy services. Dave Mann, a member of the British Hydropower Association Council, has been instrumental in the design, installation and commissioning of all but a few of all Archimedean screw power generation sites in the UK and Ireland to date with over twenty schemes fully operational and a further forty or so at various stages of development. Mann Power have commissioned several independent studies to verify the Archimedean Screw’s fish-friendly credentials and also its efficiency. Mann Power is established within the national hydropower industry as a leader in the field of designing bespoke hydro-generation installations, specialising in low head and ‘difficult’ sites which previously may have been considered unsuitable for such applications. Eco Evolution work in colaboration with Mann Power Consulting on hydro sites throughout the island of Ireland and the UK. 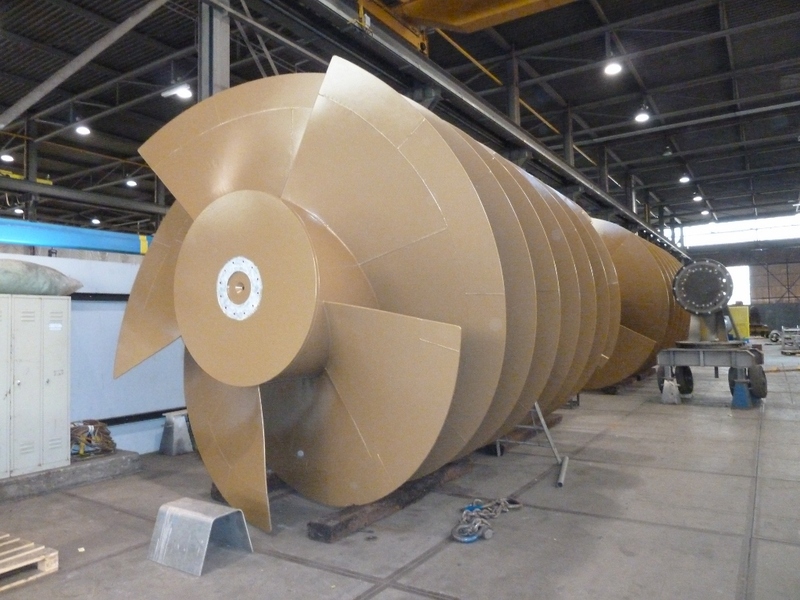 We also design modern water wheels for electricity generation. All photographs copyright of Mann Power Consulting and Eco Evolution. The system is undoubtedly excellent but the capital cost is unnecessarily too high. Hence is not commercially potential. There are numerous schemes operating across UK with excellent financial returns.